To the ancient Mirarr people of Australia's Northern Territory, the Ranger uranium mine has left a painful scar on their tribal lands. A recent contamination scare has again exposed the brittle relationship between aboriginal groups and mining companies. The Ranger facility, which lies within the Kakadu National Park, was temporarily shut down in March after workers were accidentally exposed to water polluted with uranium. A report by the Northern Territory government has recommended that the mine's operator, Energy Resources of Australia (ERA), be prosecuted. The file has been handed to the justice department and a decision is expected in the next few weeks. The Minister for Mines and Energy, Kon Vatskalis, hinted that tough action could be taken. "I have put mining companies in the Northern Territory on notice that they have to comply with the legislation, and there will be increased auditing and inspections," he said. Two days after the contamination alert at the Ranger mine, tainted water overflowed from a tank into a small channel that leads to a creek used by an indigenous community nearby. Scientific tests showed there was no contamination downstream and that the concentrations of all chemicals were well within legal limits. The incident, however, has alarmed the traditional owners of the land in Kakadu. The World Heritage area covers almost 20,000 sq km (7,700 sq miles) in Australia's tropical Top End. The park is a cultural wonderland. It has a stunning collection of aboriginal rock art and a dazzling array of native flora and fauna, including Magpie geese and crocodiles. 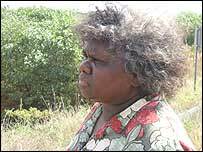 Speaking through an interpreter, Yvonne Margarula, a senior elder of the Mirarr clan, told BBC News Online that the Ranger mine had "wrecked her country". She claimed tribal leaders were forced to accept the start of mining operations in the area more than two decades ago. Ranger is due to close in 2011 when most of the uranium deposits will be exhausted. There are other uranium deposits nearby, but it seems unlikely that aborigines will allow further developments. "I don't want to see my country destroyed again," said Yvonne Margarula. "I will not agree to any other mines." Other indigenous leaders said that catastrophic events would occur if sacred sites were disturbed by fresh mineral exploration. Harry Kenyon-Slaney from ERA told the BBC he was "very proud" of the Ranger mine's environmental record, and that the mine was safe. "Consistently the Office of the Supervising Scientist, one of our principle regulators, has confirmed that we've had no detrimental effect on the surrounding environment for the life of the mine," he said. 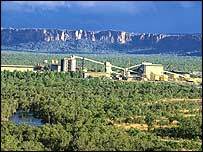 The company has paid Aus$200m (US$142m) to aboriginal groups since it began extracting uranium at Ranger. These vast royalties have earned the local tribe the nickname Uranium Sheikhs. The money has caused its leaders to wrestle with a serious dilemma - just what sort of ecological and cultural price are they willing to pay for such handsome financial rewards? "On the one hand, mining can provide the services that we badly need," said Sonia Smallacombe, an aboriginal who is an indigenous knowledge expert from Charles Darwin University. "We're a poor group of people and we want to have a better lifestyle. But on the other hand I see mining as destructive," she said. ERA's Harry Kenyon-Slaney believes that both the mining company and the traditional owners have a shared interest in carefully monitored projects. "We have a synergistic relationship," he said. "I think that to an extent they need us and we need them, and we will continue to build on that relationship."